Hawthorne-based SpaceX made more history Monday when it successfully launched a rocket carrying five dozen satellites from Vandenberg Air Force Base, marking the first time a Falcon 9 rocket has been used in three space missions. SpaceX has worked for years to perfect the reuse of its rockets to slash the cost of space missions, landing the first stage of the rockets either back on land near the original launch site or on barges floating in the ocean. It has often re-used the first stages of Falcon 9 rockets, but Monday’s launch was the first time the same rocket was used a third time. The rocket in Monday’s launch was previously used for satellite launches in May and August of this year. After launch, the first stage of the rocket made a successful landing on a barge — named “Just Read the Instructions” — floating in the Pacific Ocean, potentially setting the stage for a fourth use of the rocket. Monday’s launch occurred around 10:34 a.m. on a mission dubbed Spaceflight SSO-A: SmallSat Express. The rocket carried 64 satellites of various uses on what was billed as a “ridesharing” mission. One of the “cubesats,” which are small, often-briefcase-sized satellites, carried the ashes of about 100 people ranging from veterans to space enthusiasts, according to the company behind the satellite. 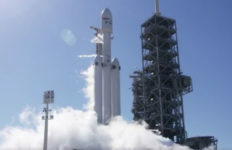 The launch had been postponed three times — once to accommodate additional pre-flight inspections, another time due to weather and the third, on Sunday, to “conduct additional inspections of the second stage,” according to the company’s website. As with previous SpaceX launches from Vandenberg, the rocket created an impressive aerial light show over Southern California. The launch was SpaceX’s 19th of the year.